Boss Zukko is a Triceraton who is the leader of a gang of Triceraton Rebels. When we first see Zukko in “Milk Run”, he is leading a gang of triceratons onto the cargo ship in search of Torbin Zixx once it entered their space. It appears Zixx has screwed them over on deals in the past as Zukko is clearly mad at him. The Turtles and Zixx easily defeat him and his gang and jettison him and his gang back into space using the escape pod of their ship. Before being released, Zukko makes it clear that the turtles are now hos enemy. The next time Zukko appears is in the episode “Zixxth Sense” in which he has the Matter Transmitter they want. 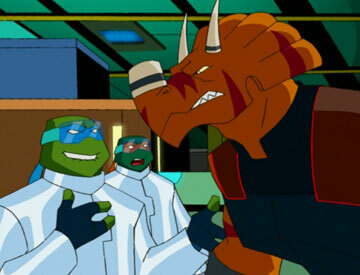 Zixx makes a fake deal with him to give him the turtles, which of course, he accepts, hoping to dish out some revenge. He is in very high spirits because of this and even agrees to give Zixx a couple of crates of Neural Scramblers and Ice-bombs to make them even as he says giving him the turtles is pay with interest. But before he can even start his revenge, Zixx defies him again and frees the turtles, escaping by teleporting out using the stolen device. The last encounter leaves him extremely annoyed with both the turtles and Zixx.